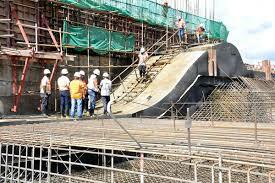 Karuma hydro power dam under construction. KAMPALA – The committee overseeing the construction of Karuma hydro power dam in Uganda has commended the Chinese contractor for working fast to deliver the project ahead of time. Both company and government officials last met in March when works had reached 74%. Currently, works have progressed to 77% in just two months. Kiggundu described the progress as “substantial and appreciable”. Speaking earlier this month, the Chinese ambassador to Uganda said the relationship between the two countries had entered a new era following the successful sponsorship of mega projects. Amb Zheng Zhuqiang also described 2018 as a year of harvest for both Uganda and China. Apart from Karuma dam being expected to be completed later this year, Isimba dam is also expected to complete by December. The two dams – Isimba and Karuma – are expected to produce 180 megawatts and 600 megawatts respectively. After their completion Uganda will have installed 1,683 megawatts.